The Track and Field teams had a solid showing last night at the Hoosier State Relays, the Indoor State Track Meet at Gladstein Fieldhouse on the campus of Indiana University in Bloomington, Indiana. The HSR is set up in Large School (Class 4A-6A) and Small School (1A-3A) sessions, based on football classifications. Click here for complete Small School HSR results. 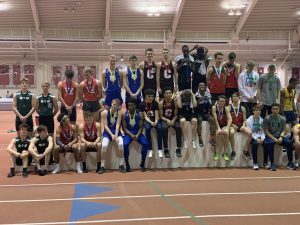 Covenant had the Boys 4×200 and 4×400 and Distance Medley Relay teams as well as Senior Ashlyn Hastings, Senior Ethan Hurt, and Junior Ariel Velligan all qualify for the HSR in qualifier indoor meets earlier this month. Junior Ariel Velligan. Photo courtesy of Tyler Wildman. Hurt got the day started for CCHS, running in the 60m Dash. Hurt, who qualified as the 23rd seed with a time of 7.41 seconds. Hurt ran a 7.37 and took 15th place. Hastings obliterated her previous school record of 12:08.0 that she set last year in the 3200m Run, finishing 17th with a time of 11:42.29. Freshman Drew Dubke, Sophomores Gabe Wilson and Tim Skaggs, and Freshman Clayton Reichanadter compromised the Distance Medley Relay (DMR) team that finished in 12:04.27 to finish in 23rd place. 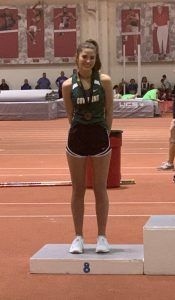 Velligan was the first Covenant athlete to hit the podium this year, as she finished in 8th place in the Girls High Jump. Velligan tied her personal record of 4’10” on her first jump of the day, and then set a new PR by clearing 5’0″. She was not able to advance past that height. The Boys 4×200 Relay team, made up of Hurt, Sr. Logan Scott, and Sophomores Ben Bradley and Gage Coffey, ran a 1:37.55 to finish in 16th place. Boys 4×400 Relay team. Photo courtesy of Tyler Wildman. The Boys 4×400 Relay team also made the podium, finishing in 8th place with a time of 3:36.24. The 4×400 team was compromised of Bradley, Hurt, Senior Justin Foster, and Junior Nate Sloan. In team scoring, West Lafayette HS won the Girls Small School competition, with 92 points. The Circle City Conference was well represented, as Brebeuf Jesuit Prep took second (86), followed by Bishop Chatard HS (52) in third and Guerin Catholic HS (34) in fourth, and Heritage Christian (7) in 21st. CCHS scored 1 point to tie for 42nd. On the Boys side, Westview HS (56) edged FW Concordia Lutheran (52), Oak Hill HS (50), Cardinal Ritter HS (44), and Calumet HS (44). CCHS scored 2 points to tie for 32nd Place. The team will now be off this week for Spring Break before returning for training next week and to competition on Tuesday, April 9th at Lutheran HS. That meet will include CCHS, LHSI, University HS, and Hauser HS.